Like those bright colors and retro patterns we’ve been seeing everywhere? Not sure how to use them? Then Fresh Citrus sarapapers™ is for you! 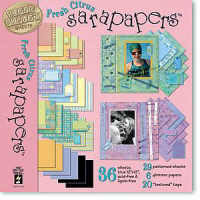 sarapapers is all about taking the trendiest looks in scrapbooking and making them easy to work with—Fresh Citrus sarapapers features fun and funky papers combining the trendiest colors (lime, yellow, orange, pink and blue) with the freshest retro patterns (argyle, stripes and tone-on-tone circles). And these papers won’t overwhelm your photos—we’ve softened the bright colors and bold patterns with a scuffed textured effect. Also, each sarapapers collection includes 6 sheets of colored glimmer paper plus a sheet of tag-art cut-outs. Papers are designed in “families” so you can make coordinating double-page spreads. Contains 36 sheets in all.